I have been working on making cute animals made out of fleece the past few days. While I love to quilt I have never worked with sewing patterns and such. So this has been a bit of a challenge for me. 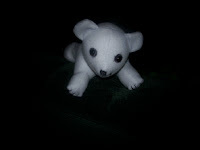 The first critter I made was Pablo the Polar Bear. I definitely made some mistakes on this one but that's ok, I learned from them :O)! 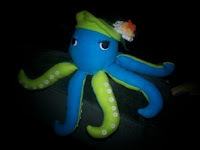 The second critter I made was Olivia the Octopus with her cool hat! This one came out much better and I have the hang of the patterns now. Please leave me a note and let me know what you think. These are your first??? They are darling and you have certainly brought them to life! Your critters are way too cute. I imagine they will be well loved by some lucky kid. Did you cut the fleece using the Black Cat Cougar? I'm considering buying a Cougar and would love to cut fabric with it, but I understand it's necessary to stiffen the fabric first. If you do that, will the fleece still be soft? Or do you wash the fabric again after it's been cut?